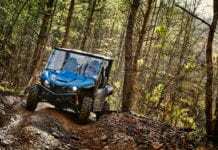 January 20, 2015 (Toronto, ON via Cypress, Calif.) –– Yamaha Motor Canada today introduced the Wolverine R-Spec EPS, an all-new Side-by-Side (SxS) vehicle that sets a new standard in off-road capability and class-leading comfort. The Wolverine R-Spec EPS is designed and engineered for those riders who explore extreme terrain. The 2016 Yamaha Wolverine R-Spec EPS boasts an all-new nimble chassis with a compact design, look and feel, a comfortable and secure cab with seating for two, Yamaha’s proven core technologies, and overall superior handling and durability with industry-leading suspension adjustability. The Wolverine R-Spec EPS’ long-travel suspension with standard KYB piggyback shocks features 9.7 inches of travel in front and 10.6 inches of travel out back – and more suspension customization than any other model in its class with high- and low-speed compression damping, rebound damping and spring preload adjustability. This best-in-class adjustability allows drivers to tune the comfort and handling based on personal preference and terrain. 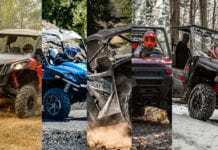 The impressive suspension package provides superior handling along with a comfortable and planted feeling while articulating through a variety of rough off-road situations. The Yamaha Wolverine combines aggressive new styling with a nimble and compact-feeling chassis designed to maximize visibility while allowing the driver to navigate tight, technical trails and challenging terrain. 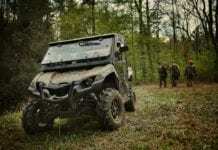 The vehicle’s 81.3-inch wheelbase, 11.4-inches of ground clearance and wide-arc A-arm design provide maximum terrainability and ground clearance. 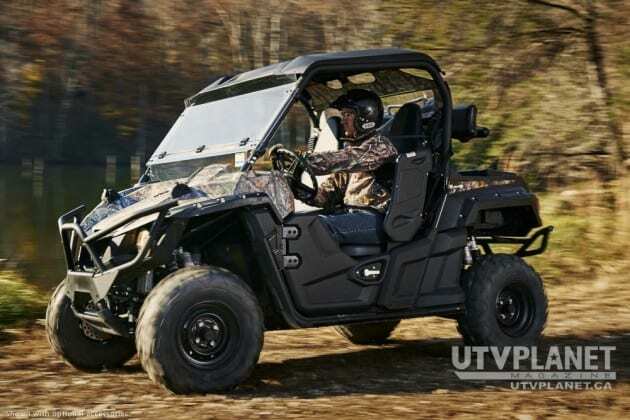 Designing the vehicle for extreme terrain and durability, Yamaha incorporated features like rear wheel protectors that extend from the bottom of the frame to reduce obstacle contact with rear tires. The chassis is upswept on the sides more than two inches higher than the center of the frame to help the vehicle more smoothly pass over obstacles. Full-coverage skid plates front-to-back and side-to-side eliminate catch points and increase glide points. For added protection, Yamaha incorporated standard front A-arm-mounted CV boot protectors and rear A-arm built-in skid plate protectors. Yamaha employed durable steel wheels (12 x 6 in the front and 12 x 8 out back) and all-new exclusive 26-inch Maxxis Bighorn 2.0 tires providing optimum traction, durability, comfort and steering precision. The Wolverine’s automotive-style cab with all-new supportive high-back bucket seats is designed to provide maximum comfort and confidence for both driver and passenger, especially in extreme off-road environments. The seating area’s compact yet comfortable feel features well-placed controls. The driver’s seat is three-position adjustable, and the passenger is provided with a three-point adjustable dash-mounted handhold. Dedicated floorboard panels allow for maximum legroom while simultaneously creating a planted feeling, especially in rough and rugged terrain and on long off-road expeditions. 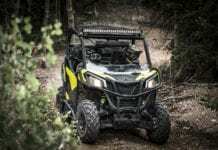 The Wolverine’s all-new cab design features a new center console with multiple storage options. Three-point seat belts and shoulder bolsters – and even the new engine positioning – all work in concert with the new chassis and cab design to create the best balance of optimum occupant comfort with maximum off-road capability. More interior functional features include two cup holders, two center console storage bins, a dash-mounted glove box and under-seat storage, and digital display panel with speedometer, odometer, dual trip meters, hour meter, clock, fuel gauge, gear position indicator, and four-wheel drive setting. 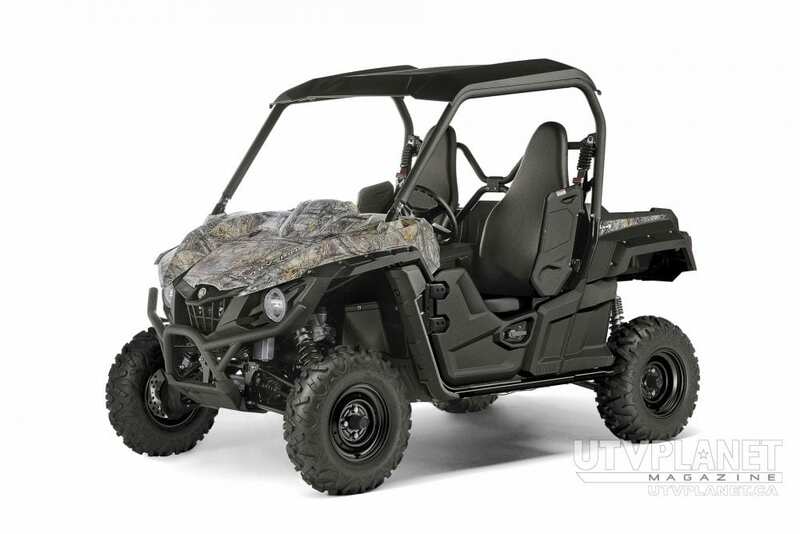 The Wolverine features a standard 12V DC outlet for powering accessories and personal items on the trail, while its new gear selector and parking brake lever are placed in intuitive, convenient and comfortable locations within the center console. 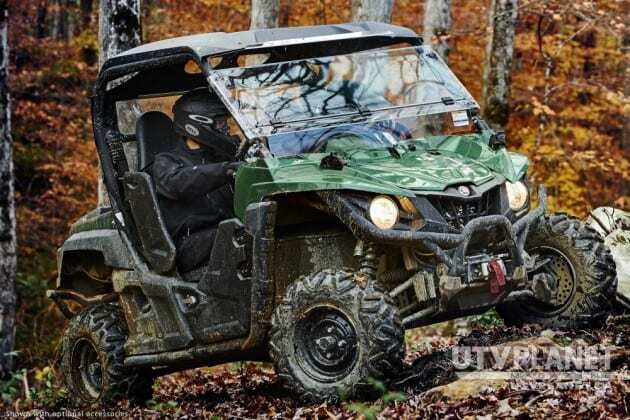 The Wolverine R-Spec EPS comes standard with a dealer installed hard sun top and ROPS US OSHA/ISO3471 cage to provide added protection from the elements. Yamaha incorporated industry leading and proven technologies into the new Wolverine R-Spec EPS chassis that all combined to create a new level of off-road capability in its class. 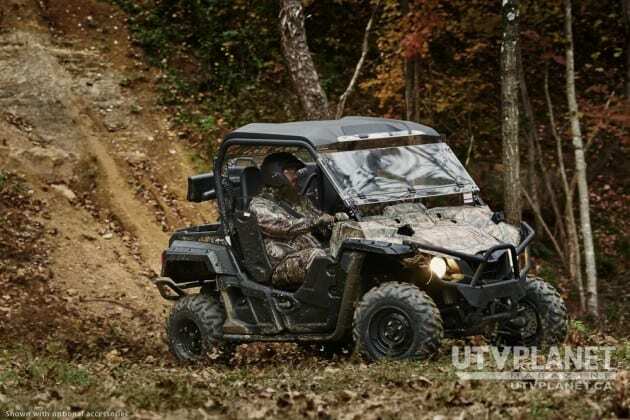 Yamaha’s On-Command® four-wheel drive system features 2WD, 4WD and 4WD with diff-lock – and puts control in the driver’s hands with an intuitive dash-mounted dial. The driver-controlled system eliminates hesitation or slipping while waiting for a computer to engage, which is common in some competitive models. 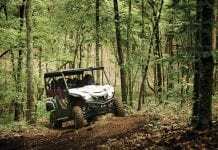 Yamaha SxS vehicles have a reputation for durability and reliability, and this is due in large part to the exclusive Ultramatic® automatic transmission that has been proven to have the industry’s most durable CVT system. The centrifugal clutch with integrated cooling fan maintains constant belt tension. This eliminates any potential slipping and slamming of the belt when at idle or engaged, ultimately reducing belt wear and heat. Featuring high, low, reverse and neutral, the Ultramatic system with one-way sprag clutch is not only the most durable, but also provides the industry’s most consistent and natural-feeling engine braking that eliminates “free-wheeling” – an important feature especially when traversing extreme terrain. The Wolverine‘s superior handling is achieved by the combination of numerous design and performance features including Yamaha’s Electric Power Steering (EPS) with rack and pinion steering. 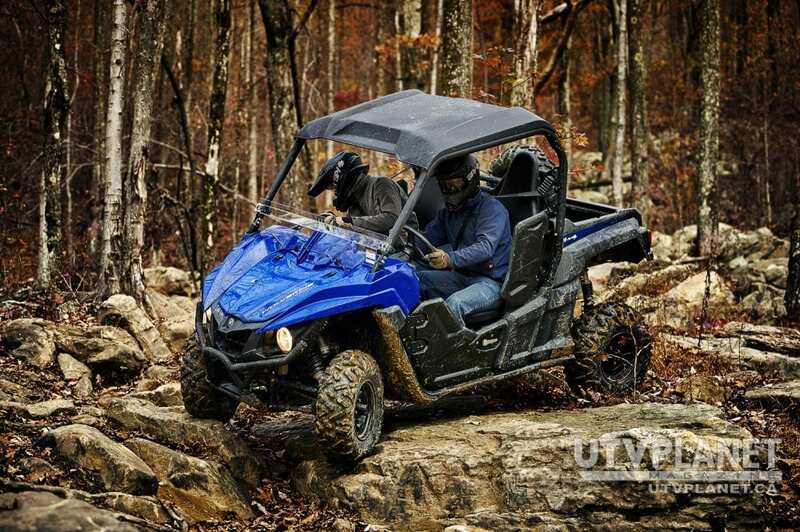 Yamaha’s EPS provides the industry’s best balance of assist and positive feedback from the trail, providing maximum comfort and confidence with optimized steering ratios, a light steering feel and precise handling. 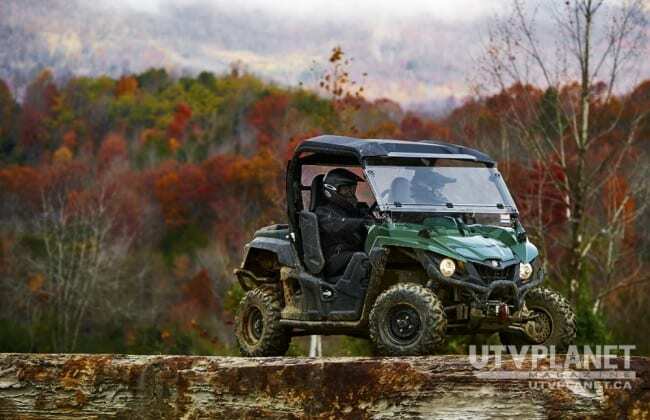 Yamaha incorporates durable four-wheel disc brakes providing strong and predictable stopping power and feel. A separate new wet parking disc brake system provides increased durability and protection from the elements. The all-new Yamaha Wolverine R-Spec EPS features a new double overhead cam (DOHC), 708cc engine with optimized torque, power delivery and engine character – for exciting recreational driving. The fuel injected, four-valve engine packs a 10.1:1 compression ratio and 103mm bore by 85mm stroke. A new Air Induction System (AIS) produces less emissions meeting the latest EPA standards, while the engine’s power character and delivery is optimized for technical terrain and extreme off-roading. 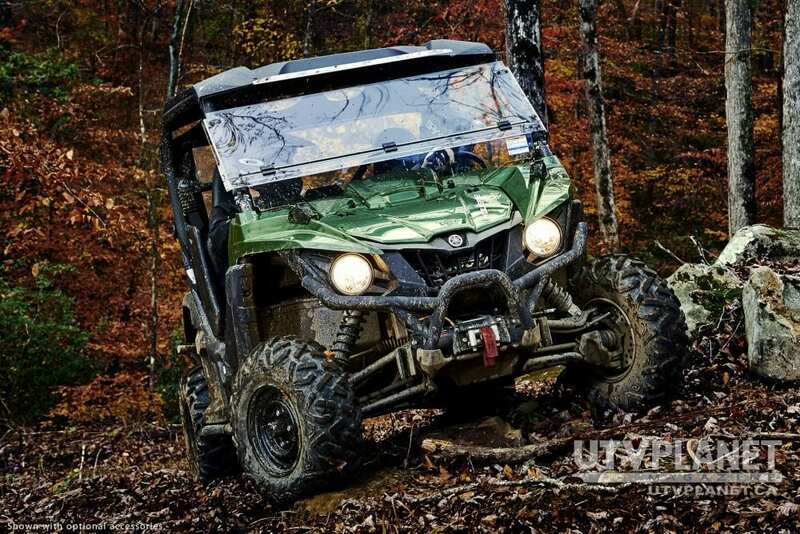 The Wolverine R-Spec EPS features a high-volume air intake that is elevated to keep it out of the elements and optimizes power character for off-road situations. The oversized dual foam filter with reusable design is located under the easily removable center console and requires no tools to clean and return to the trail. Yamaha’s thoughtful design incorporates simple service features such as coolant, engine oil and gear oil drain holes that are built into full-length skid plates and easy to access battery and marine-grade electrical components under the removable hood panel. The Wolverine R-Spec EPS is built for expedition length adventures with a 9.7-gallon (36.7 litre) gas tank and a lightweight and durable injection-molded composite fixed-position cargo bed. Six steel tie-down points are connected to the chassis and a removable tailgate can be stored and secured in the front of the bed that also has a built-in one-inch divider. The bed is rated to haul up to 300 lbs. of gear and supplies, while a two-inch receiver hitch is rated to haul an additional 1,500 lbs. of weight. The all-new Wolverine R-Spec EPS will be available in Yamaha dealerships across Canada starting in April. Standard models feature a hard sun top and come in Steel Blue and Hunter Green. The new camo Wolverine R-Spec will be the first ever SxS to feature Realtree Xtra Camo. MSRP for blue and green models are $15,399 and $16,099 for the Camo version. 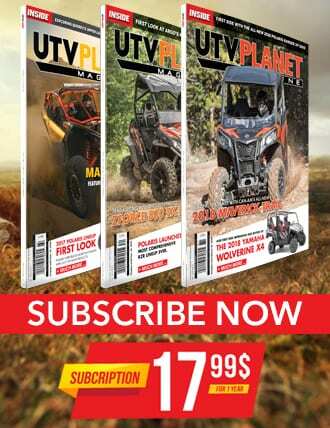 More information is available at www.yamaha-motor.ca.